Opening Reception at Kakar House of Design Wednesday, Nov. 28th 6 to 10 p.m. 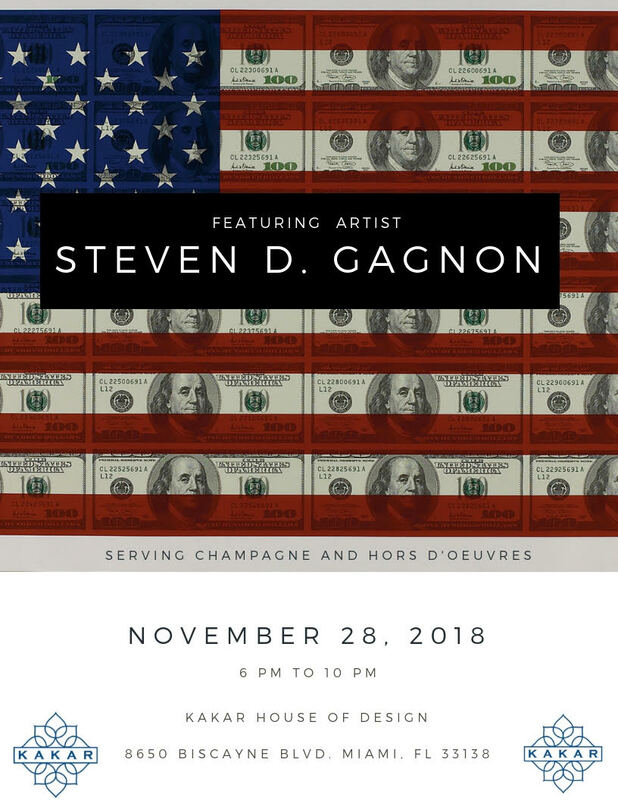 I would like to personally invite you today, Wednesday, November 28th from 6 – 10 p.m. to the catered, opening reception of an exhibition of a number of my artworks at Kakar House of Design. If you would like to attend, please rsvp here. 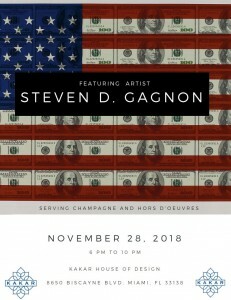 Welcome to StevenGagnon.com, the best way to keep up with all of my artistic activities, news, and upcoming exhibitions. I have neglected my blog for sometime now. My focus has been diverted into other projects, and my artwork has not gotten my full attention. Now as the dust is settling on these other endeavors, I can now direct my energy back into my work. I have been involved in shows and exhibitions. In April of last year, the Border Cruiser was exhibited in West Palm Beach. In August, I had work at the Sagamore Hotel. 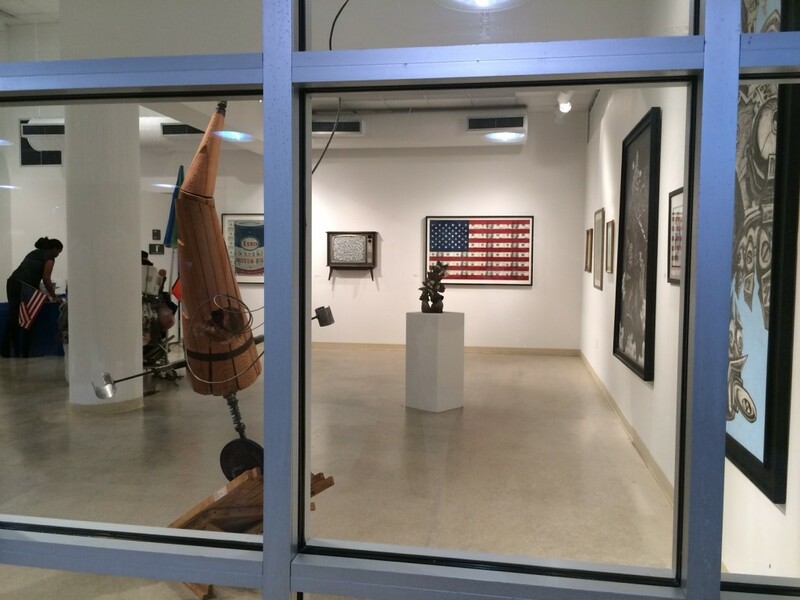 During ArtBasel, Markowicz Fine Art had a number of works on display in their Miami Design District gallery. And recently, I have a number of works up in a new show that opened at the Sagamore Hotel in February. Currently, I am getting my studio up and running again in North Miami to make new work. I trust this finds you well and look forward to sharing with you the fruits of my labor soon. Miami FL 33137. As for other news, I have been busy setting up the studio as well as developing new pieces. I look forward to updating my website in order to share all of my latest creations. 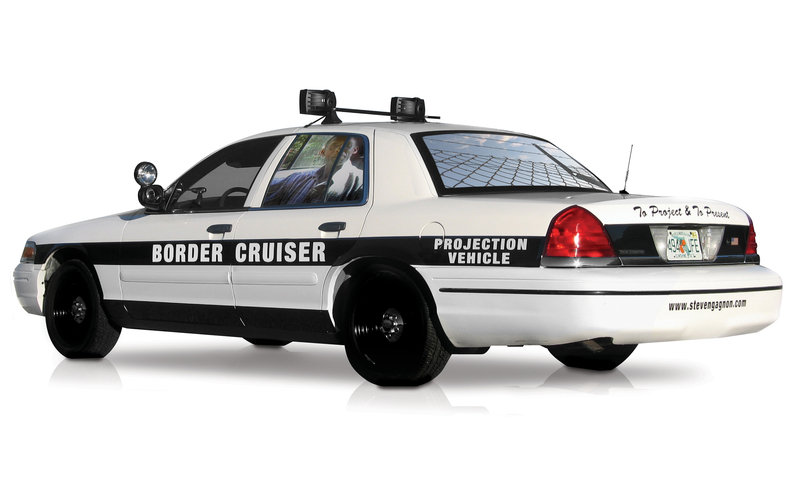 I have been invited to present the Border Cruiser at Outside the Box3 at Whitespace – The Mordes Collection located at 2805 N. Australian Avenue, West Palm Beach, FL 33407. The exhibition is a two day affair running on the evenings of April 1nd and 2nd from 7:30 to 10:30 p.m. The outdoor site-specific art exhibition will feature 43 artists selected by curator, Lisa Rockford. Happy New Year! 2015 will be a year of much change. My artist residence at the ArtCenter South Florida will end on April 30th due to the sale of their icon ArtDeco 800/810 building were I currently have my studio. As a result, I am currently in the process of buying a building in Miami. If all goes well, I will close on the property at the end of February and have a new space for creative exploration. Until then, I am still working and developing new pieces. I am continuing with the investigation of juxtaposing images and objects to convey new meanings. I look forward to posting the results soon. I wish you all the best in 2015 and perhaps see you before I leave Lincoln Road. I have a number of shows taking place currently. 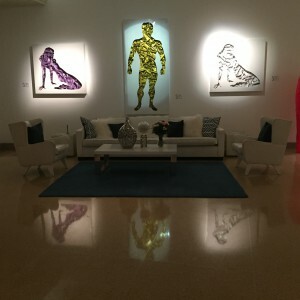 I was invited to participate in “Art Outside the Beltway,” a three person exhibition at Broward College South Campus art gallery that opened October 13th and will run until November 1st. 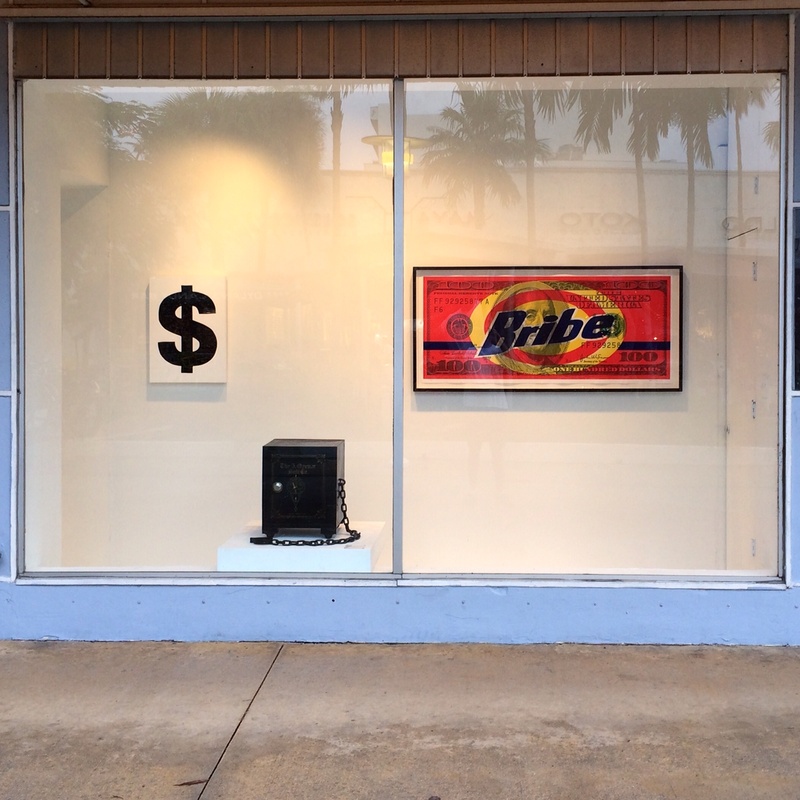 On Lincoln Road, I am exhibiting in one of ArtCenter South Florida’s storefront windows which features the Money Laundering (Bribe) print, Financial Burden, and new piece of a dollar sign made of toy soldiers. The Lincoln Road window installation will run from October 15th to November 3rd. In Germany, Galerie Burkhard Eikelmann will be presenting a number of my artworks at Art Fair Cologne from October 24th to 27th. Also I recently set up an instagram account, so please visit steven_d_gagnon to see the latest works in progress and photos from the studio. 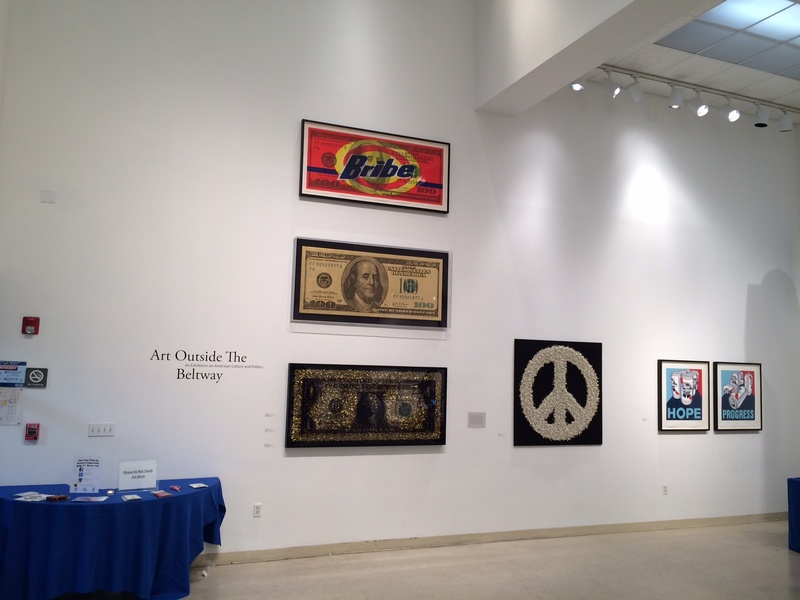 I just returned on Thursday night from driving up to the Hamptons in New York for the Art Southampton Art Fair. The show went very well. Markowicz Fine Art was able to sell my two new cut out pieces at the fair. 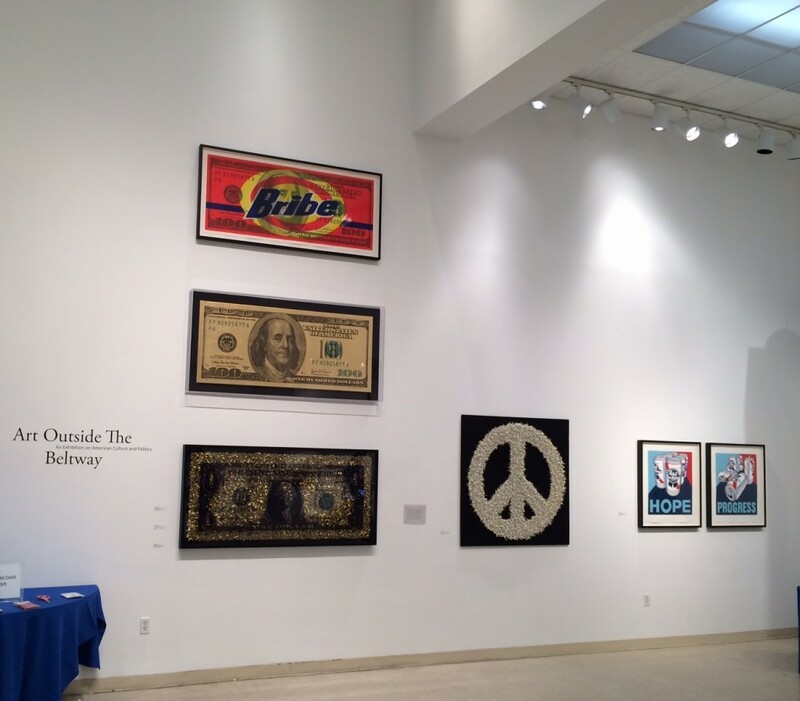 As well, I was able to spend time with my German gallerist, Burkhard Eikelmann, who will include the large and small Money Laundering prints, the HOPE and PROGRESS serigraphs, and the Dollar Spangled Banner in the upcoming Great American Summer Show that opens August 10th. Now that I am back, I have been taking care of a lot of things that have been neglected since I have been away. I hope to be caught up with everything by Tuesday so I can get back to focusing on a new body of work about which I am very excited. I have been a bit delinquent with updating my blog the past few weeks. In that time, I went to New York for the Frieze Art Fair as well as to see the numerous other satellite fairs. It was a nice break from Miami, and I got to see old friends and as well as some great artwork. Since I have been back, I have been developing a new body of work that is showing a lot of promise. 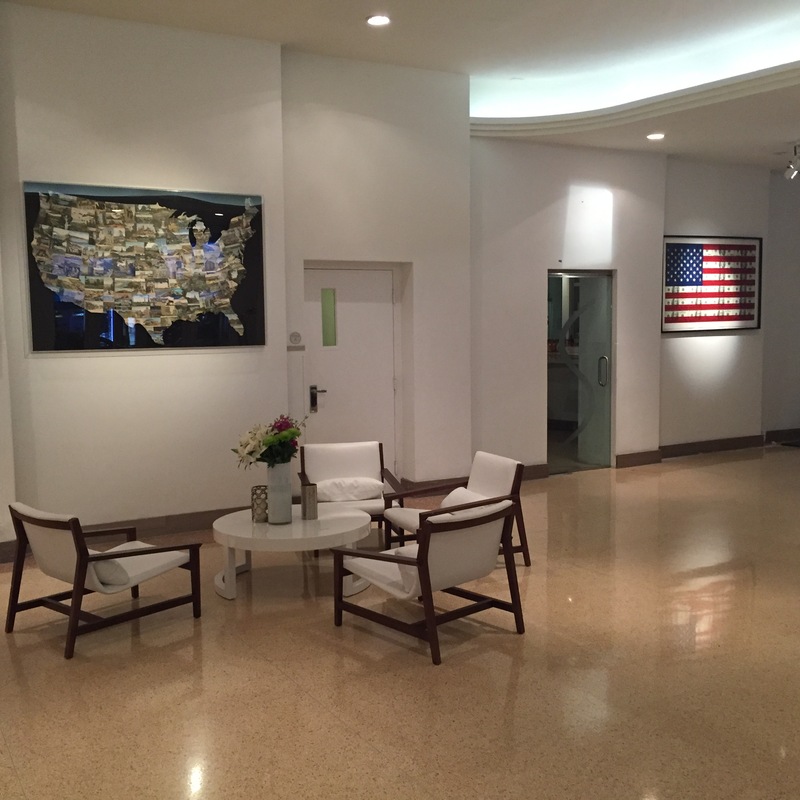 As for other news, Markowicz Fine Art is showing a number of my pieces at the Art Southampton Art Fair, the Hamptons premier international contemporary and modern art fair taking place, July 24 through 28, 2014. 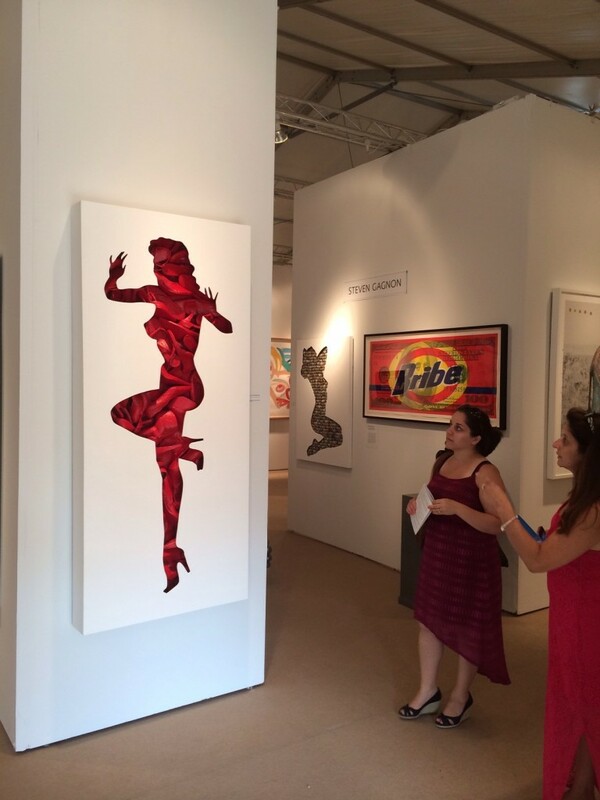 The fair features more than 90 international art galleries that focus on works from the 20th and 21st centuries. For complimentry entry passes, please go here. Also I recently set up an instagram account, so please visit steven_d_gagnon to see the latest works in progress and photos from the studio. 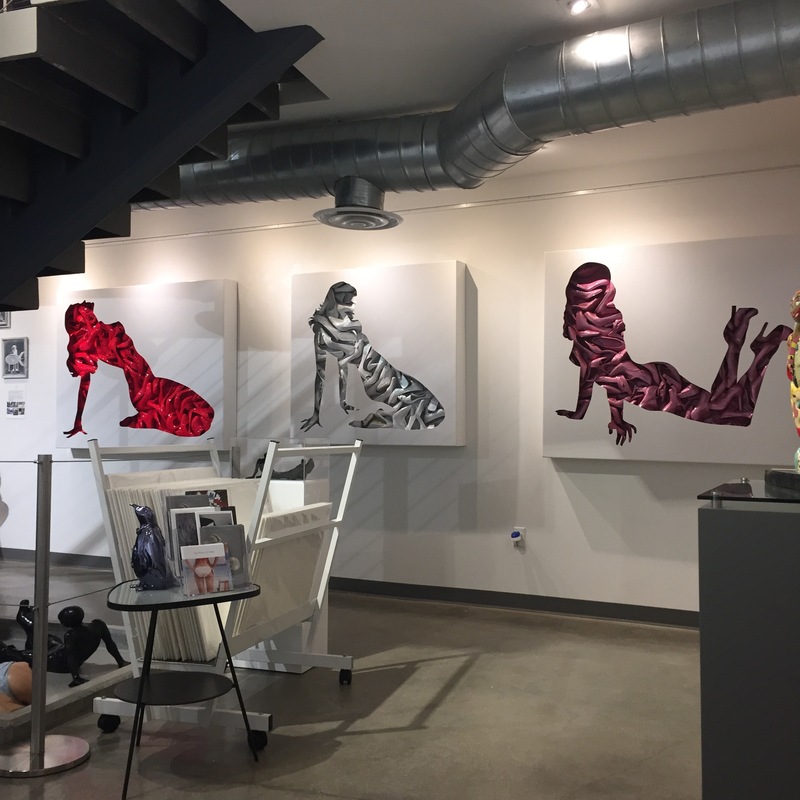 Major changes were announced this week that the ArtCenter South Florida where I have my studio will sell their landmark building located at 800 and 810 Lincoln Road. It is estimated the process will take a year. So in the upcoming months, I will be finishing up loose ends and making plans for the future. 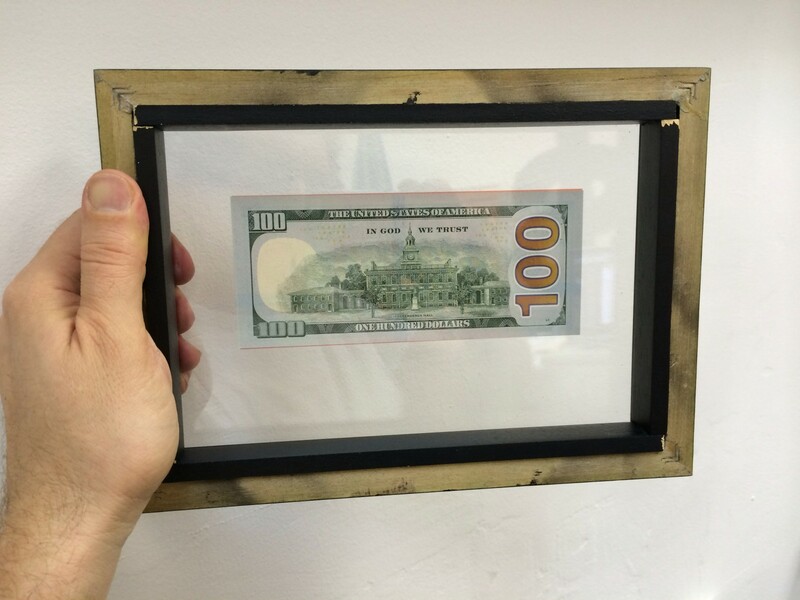 I recently launched a new print edition using an actual $100 bill. The work which measures only 9 7/8 x 7 x 1 1/8 inches framed is a smaller version of the Money Laundering (Bribe) print. 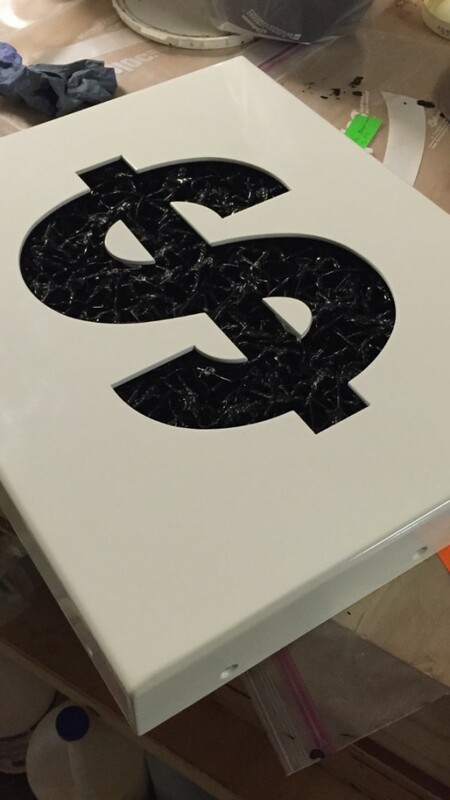 However since the smaller piece uses a real $100 bill, it could really be used as a Bribe if given as a gift. 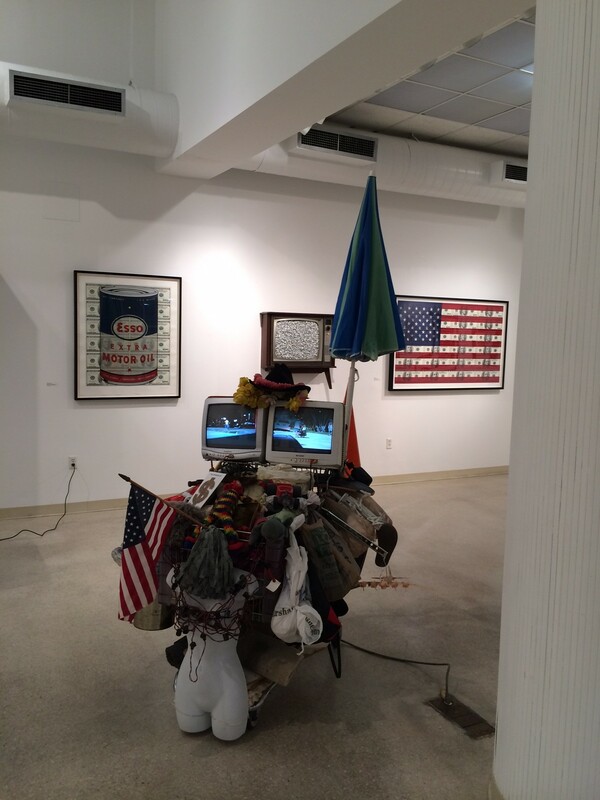 As for other news, the opening of the two person show that I was part of at Markowicz Fine Art was a success! There was a good turn out of people and a number of works sold during the opening. The exhibition will run from now until the beginning of May, so you still have time to check it out if you haven’t seen it already. As for myself, I have been re-establishing order in my studio after the hectic pace to get ready for the exhibition. It is so nice to have the artwork properly hung as well as making room by getting rid of excess materials. I can finally walk around and work in my space again! So now that the dust has settled, my plan is to get back to making new pieces as well as finishing up works that are almost done. The opening of the two person show that I was part of at Markowicz Fine Art was a success! There was a good turn out of people and a number of works sold during the opening. The exhibition will run from now until the beginning of May, so you still have time to check it out if you haven’t seen it already. 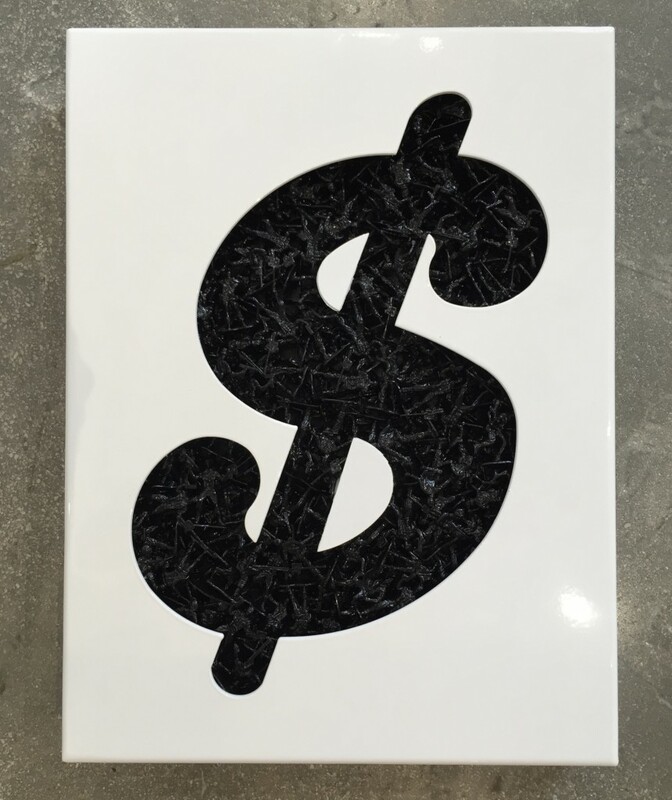 As for other news, I recently launched a new print edition using an actual $100 bill. 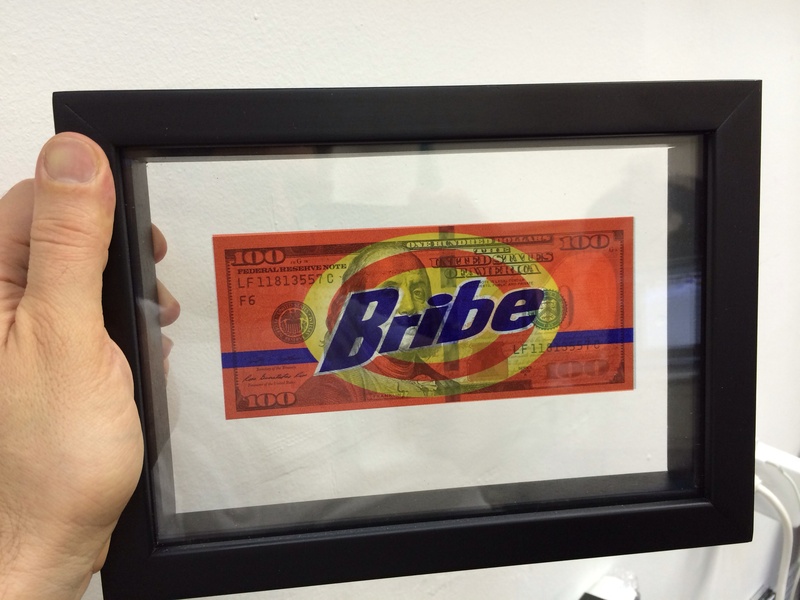 The work which measures only 9 7/8 x 7 x 1 1/8 inches framed is a smaller version of the Money Laundering (Bribe) print. However since the smaller piece uses a real $100 bill, it could really be used as a Bribe if given as a gift.